We’re hoping to reduce our footprint (and our refuse) a bit by asking diners to bring their own plates, cups, and utensils. We will have paper plates in case you forget, but we’d love to produce less trash! 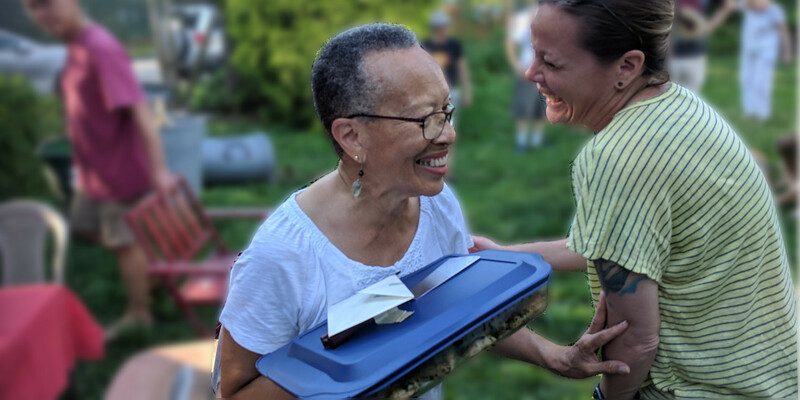 There’s plenty to share at our our monthly potluck dinner on Saturday, Aug. 25, at 6 p.m.: produce, recipes, gardening advice, conversation, and more. Please bring a dish if you can, but you’re welcome to stop by even if your hands are empty. After dinner, we’d love to see you at the Kelly School, where the Kelly Green Project will be hosting an evening of independent short films by local and international filmmakers. Ursula Rucker, a Germantown poet who has headlined the First Person Arts Festival and recorded with the Roots, will perform as well. Admission is free! The program begins at 7:45 p.m.
We look forward to seeing you in the garden.